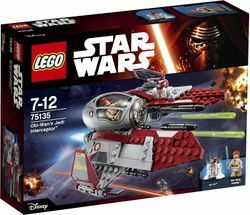 75135 Obi-Wan's Jedi Interceptor is a Star Wars set released in 2016. The set is based on Obi-Wan's red jedi interceptor. Go on exciting rescue missions with Obi-Wan’s Interceptor! Brave Obi-Wan Kenobi is ready to launch another daring mission in his sleek Jedi Interceptor. Jump into the cockpit and lower the Astromech Droid into position. Then arm the spring-loaded shooters, extend the wings and get ready to launch! Features an authentic color scheme, opening cockpit with space for Obi-Wan to sit in, dual spring-loaded shooters, extending wings and space for an Astromech Droid. Recreate the exciting opening scenes from Star Wars: Episode III Revenge of the Sith. Measures over 2” (6cm) high, 6” (17cm) long and 6” (17cm) wide. 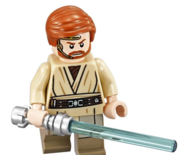 Facts about "75135 Obi-Wan's Jedi Interceptor"
This page was last edited on 12 January 2016, at 21:32.